After seven successful Mount Everest summits, climber Peter Athans, aka Mr. Everest, still seeks out rigorous emotional, mental, and physical adventures in his lifelong quest to never stop challenging himself. 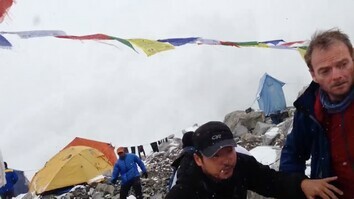 Mount Everest is a place where I think I found the most portals to discovery for myself, personally. Everest has been in the news quite a bit recently chiefly because of a huge, devastating avalanche that took place last April where a number of Nepalese climbers predominantly from the Sherpa ethnic group were killed in the support of Western mountaineers. Of course mountaineering is certainly by some people's view almost an indulgent type of a sport. We're not going to save anyone's life doing it. We might actually by not doing it save our own lives. But where we find ourselves and certainly what climbers share, I mean, amongst a variety of different things, perhaps a deficient sense of hygiene amongst others. But we have this great sense of wanting to impose ourselves or place ourselves in a humble way inside this incredible, dynamic, ever-changing present environment. Now certainly we try to overcome this environment, we try to work with this environment. As athletes we certainly have great technical skills, the ability to climb rock, snow and ice. But we also learn technological skills and psychological skills to match that. Of course the motivation for this is something that has been studied certainly since the time Everest was first discovered and even long before that. What motivates climbers to keep going to that place? And ultimately we find ourselves navigating our lives through this sense of eternity coupled with impermanence. And this is part of certainly my Buddhist training, that we essentially are all going to have a death of this life. We're not going to know where we're going to move through into the next one. How do we navigate this on this great path of self-actualization? And certainly people like the early explorers going to Mount Everest in the 1950s. George Mallory for one, he would've taken this picture back in the early 1920s. When they first actually reached the mountain. Of course many people know that Mallory was a person who uttered this great four-word phrase that is derivative of all human motivation to climb Everest. We go to climb because it's... because it is there. Little bit cryptic, don't you think? I mean, certainly it's there, it's the highest point on Earth, once, you know, the cartographers and geologists discovered that. But Mallory would also write later, you must understand that there is something in all of us that responds to the challenge of this mountain and goes out to meet it. That the struggle is the struggle of life itself, upwards and forever upwards. And, that's the reason why we go. For what we take from this adventure is nothing but sheer joy. And joy is, after all, the object of life. We don't live simply to eat and make money. We eat and make money so we can enjoy life. That is what life means and what life is for. And you have to understand that George Mallory's generation was nearly decimated in World War One. Many of the climbers who went on this, these first three forays to Everest were all part of the military, had lost friends, had lost family, had lost so many different parts of their lives. Many of them, many people actually saw the Mount Everest expeditions as a way to reintegrate themselves into their real lives, to their passionate lives to the ones they had before the war. And by going out into this challenging natural environment that they could do this, that they could succeed. It's a very romantic type of a notion that is one that Mallory wrote extensively about. Of course my time on Everest was a bit later than Mallory's. I started climbing in 1985. I had to fail four times before I was able to summit and then the next seven times were quite a bit easier as a result. But for me personally, climbing has always been a tool for self-actualization, it's been a way that I challenge myself day in and day out. There's always a way that I can improve, there's always a way that I can rigorously analyze my approach, there's always a way I can find greater, more collaborative team members. The mountain is always different. The environment is always changing. It's a dynamic environment. Many of the challenges are the same, obviously. But, you know, like Heraclitus said, “you never dip your foot into river twice.” It's always different, it's consistently changing. So this type of environment is one that requires a very rigorous approach and constant evaluation of it. Of course for me being on Everest, learning about the local cultures, especially the Sherpa. People who have lived in this region for upwards of 400 years. 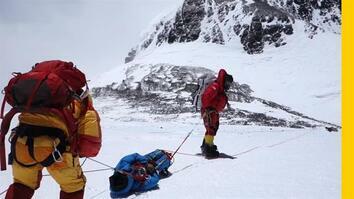 But we climb with the Sherpa and we learn that their motivations are very different from ours. They don't have a shred of romance. They are in some ways fearful of this place. They are also concerned about not propitiating the spirits by trying to climb to the rooftop of the world. At least some of the early Sherpa involvement on Everest certainly back in the 1920s and even in the 1950s, when Sir Edmund Hillary went to climb with Tenzing, there was still this sense of fearfulness in many of them that they might somehow be violating or some way insulting these local gods and spirits. 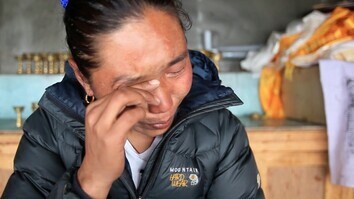 But in recent years Sherpas have with their burgeoning skills and their craft on Everest, they've also taken on greater risk because the pay is good. And I know that many of them have real conflicts because they're also Buddhist and they realize that to actually become and to find an incarnation as a human being means that you've led a very virtuous life. You've been really blessed with this great human form. His Holiness Dalai Lama said, the likelihood of you arriving in human form is like rising out of the Pacific Ocean with your hand through the donut of a life preserver. Just with a random rising through the ocean. So, why do you want to take on that excessive risk? Why do you want to threaten that human life on your great path of self-actualization? Shouldn't you be doing something like these monks who are working towards the betterment of their own communities? I've not only been a mountaineer on Everest. I've had the benefit to go into the Kingdom of Mustang and to do archaeological research that was featured in the Sky Caves article couple of years back. It's been a great opportunity for my family. You can see my wife here who's a filmmaker, who's a big part of the team and my daughter Cleo is doing sound recording on the back there. And we do some work with literacy, not only in the Everest region but also in Mustang. We've tried early on to instill in our kids this great sense of service. And to try and to get to know and understand the local populations. You know, a lot of people have described climbers and climbing itself as being one of the most celebrated compulsive obsessive disorders that's out there. You know, I think throw in a little bit of narcissism and then the bad hygiene, you kinda get a pretty good idea of what most climbers are like. But we try to get up into these wild places, some of which we have to climb very difficult rock, mostly because it has little integrity. It's almost like mud. So we have to work with very primitive tools and find our way into these caves, that sometimes are on cliffs that are thousands of feet high. Of course we come out of these caves having worked in the dust, having worked in the mud and we definitely look like we've been put through the wringer a bit. And so, when that happens I have to call in my son Finn, and I really send him in as well. This is a real family type of a project and we look at our teammates as real family members as well. See my daughter here, she's with Dr. Mark Aldenderfer. They were unraveling one of these remarkable gold and silver annealed masks that we found in one of our caves in a village known as Samdzong which is right up against the Tibetan border in the Kali Gandaki region of the Central Himalaya of Nepal. Jacqueline Eng, she's not doing a tantric ritual there. She's actually a bioarchaeologist and she's studying some of the bones to try to get an idea of what type of lives these people led. She looks at bones almost like a book. And she can figure out by the condition of the bones and the type of markings on them what the life and health of that-- of that individual was actually like. Dr. Christina Warinner who does some of the work respective to our-- our genetic extraction from teeth, who's working right now on trying to put together a genetic genotype that gives us an idea of where these people are from. And we can have, I think a better understanding of where the origins of the original people inhabiting these places are. And we've been able to help rewrite some of the history of the peopling of the Himalaya and migration through those incredible mountains. So, just to give you an idea we are frequently suspending ourselves from ropes, climbing up some of these remarkable mud-encrusted, completely unstable cliffs using pneumatic hammer drills, using rebar anchors because the material is just so difficult to bind and so difficult to anchor in. And it's not infrequent that we're actually taking extreme risk getting up into these places to try to push back on our ignorance, to try to push back on this yearning for knowledge. And ultimately for me personally that's where it all is. It's about self-actualization and it's about acquiring wisdom. It's also about inspiring the next generation, it's about inspiring my own children. And certainly as a parent, as a husband, as a son, I worry consistently about having my kids in an environment that, you know, obviously could be very threatening. By the same token, as a parent I don't want to insulate them so much that they never get off the Xbox or the iPad. And I think you parents know what I'm talking about here.